Launch into spring with fresh gear, game-changing gym tools, and your new favorite protein powder. White cake with frosting is one of my favorite things on earth, so I'm a total sucker for anything birthday cake flavored. 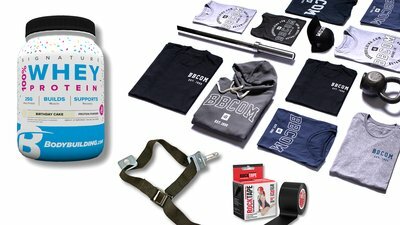 Judging by the overwhelming response when Bodybuilding.com released its first birthday cake protein in 2018, plenty of you feel the same way. The latest version of this fun, yummy protein powder was made in honor of Bodybuilding.com's 20th birthday in 2019. It totally satisfies my cake cravings, and it supports my goals instead of punching them in the face like real cake does. Each scoop delivers 10 grams of whey isolate and 7.5 grams each of whey hydrolysate and whey concentrate, providing a total of 25 grams of high-quality protein with a creamy flavor. I can't wait to make protein fudge with this. And yes, it even has sprinkles. The Swole Strap is one of those rare online fitness gadgets that doesn't try to "disrupt" the way you train now, but simply make it a little more effective. It's an adjustable nylon strap with a pin and a loop—nothing fancy, but when attached to a common gym cable stack, it allows you to select two different weights for different portions of the same movement. Similar to the way that bands or chains can alter big moves like deadlifts and squats, the Swole Strap allows you to invert the "strength curve" of cable movements, adding extra weight where you're strongest and limiting it where you're weakest. On movements like lat pull-downs, curls, and fly variations, I could feel the difference instantly, in terms of far greater muscle activation at the peak contraction. Best of all, it takes up next-to-no space in the gym bag and is sold at an easy-to-justify price. This could be a perfect "secret weapon" to get the most out of training in a commercial gym or hotel. With the sudden increase in activity that comes each spring can come a sudden increase in aches and pains. More and more athletes head off the inevitable joint and muscle issues with some strategic kinesiology taping, using pre-cut strips of RockTape. This flexible athletic tape is designed to support your muscles and joints without limiting movement, while simultaneously improving fluid dynamics under the skin. When applied correctly, kinesiology tape can help improve circulation and lymph fluid drainage to help reduce pain and promote recovery. It can be tricky to apply the first time around, so check out this article to familiarize yourself with the process, or hit up your trainer or CrossFit buddy to show you the ropes—er, tape. And for experienced tapers with more specific needs, RockTape also comes in non-pre-cut rolls, sweat-proof, and extra-tough, water-resistant, and hypoallergenic varieties. Birthday cake is just the start of the party. Bodybuilding.com is going back to our roots and celebrating our 20th birthday by releasing the limited-edition Est. 1999 clothing line. It features all of your favorite cuts and fits, including crop tops for the ladies, V-neck tees, and trucker hats. This lifestyle collection displays our clean and bold vintage logos so you can proudly rep your lifting life in style. The Est. 1999 gear has you covered with comfy fabrics that are wearable at home, on the go, or while crushing your hardest training sessions. My personal favorite is the super cozy campus hoodie. It has a flattering fit and goes great over the campus crop tank when I'm done with a tough workout! Everything in this line is only available for a limited time, so stock up!